Graphic courtesy of City of Long Beach. File photo by Ariana Gastelum. 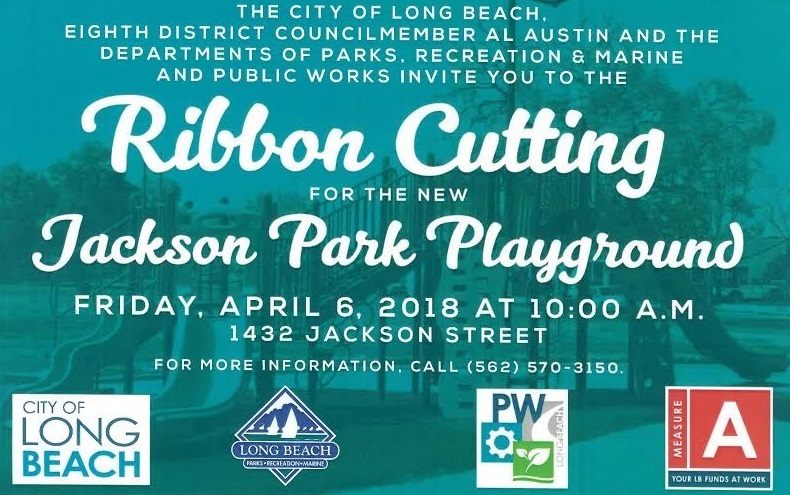 A grand opening ceremony for the completed reconstruction project of Jackson Park Playground will be open to the public on Friday, April 6th. The project included a $150,000 upgrade of the previous playground which is the first of five Measure A-funded playground upgrades throughout the city. The construction project demolished the previous playground, play surface and walkway, replacing it with a new playground structure with shade, rubber safety surfacing, a new concrete walkway, swings and benches. Additional improvements to the surrounding concrete area and rubber surfacing were made to meet Americans with Disabilities Act (ADA) requirements. According to officials, the playground equipment offers a variety of play experiences helpful in childhood cognitive development and healthy outdoor activity. The event will begin at 10:00AM and is located at 1432 Jackson Street.